Sea Battle is a DS/3DS title based on the popular Hasbro game Battleship. For anyone not familiar with ‘Battleship’ it’s a light, turn based strategy game in which two players lay a sequence of ships on top of a grid and take it in turns to guess the coordinates of their opponent’s ships. Sea Battle takes this relatively simple premise and has expanded on it with a few new features and some new single player modes where you can play against the game’s AI. Given the nature of this game there is no plot or campaign mode to speak of, however there are a handful of different game modes. There is classic mode where you can play the simple classic game either wirelessly against a friend or against the system. 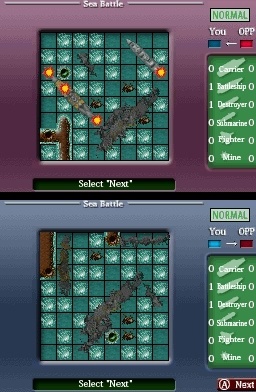 Then there is modern mode which offers some variety to your game by allowing ships to be laid diagonally, the inclusions of mines which when hit will result in the opponent missing a turn, and there is also a selection of randomly placed weapons which allow for stronger attacks that cover more ground. Last of all is the ‘mission mode’ which consists of a very small collection of single player battles that you play in the modern mode with certain conditions and handicaps to keep things fresh. Traditionally when you play Battleship your arrangement of ships would be laid flat in front of you and the blind grid where you guess your opponents position would stand upright behind it. Sea Battle has attempted to mimic this on the dual screen, however since you guess your opponents position using the touch screen these two grids have had to be swapped around. 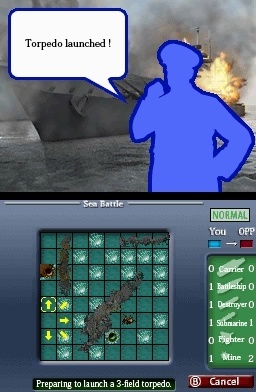 Turning board games into video games isn’t a new idea and Sea Battle is competent at what it does, however I did experience a few issues with it from a technical standpoint and had many objections with it from a presentation standpoint. The main technical problem I had with it happens in the single player mode. There were times when the AI would hit my ship, proceed to hit a few surrounding cells to further damage it, but not finish it off. This wasn’t necessarily an issue when there were other ships on the grid to locate, however when the AI had hit all of my remaining fleet it wouldn’t finish the game straight away. Instead it would extend the play by taking pot shots into the open water. This wouldn’t happen in a real game and it felt as if I was being given an unfair advantage. One feature that I felt this game could have benefited from would be an option to speed up the play. It’s only a small issue but I did feel as if I was spending longer than was needed waiting for my next turn. Against a human opponent this is understandable as they need to think about their next move, but it would have been nice if the one player game was a little faster. One thing that confused me during the ‘Mission’ mode was that in all the other modes you can lay your own grid out and place the ships & mines strategically, however while attempting the missions your grid is laid out for you by default and you do not have the option to adjust it. This is disappointing as it removes a piece of the strategy element. The biggest disappointment with this game is actually in the presentation. On the whole the game isn’t very pleasant to look at. Not only are the graphics poor but there are too many conflicting styles. Some of the screens consist of stock photos of military technology. This conflicts with the play screen interface graphics which are all very simple, bland and do not represent a genuine warship interface. The biggest offender for me would be the unnecessary characters that make comments after every move. The characters are represented as featureless pastel colour silhouettes, and demonstrate a bit of a lack of effort. Given that this game is built on such a simple premise it would have been nice to see a bit of effort go into the presentation. The game could have been made in a cartoon style, a retro style, a realistic military style etc. Instead it’s just a bit of a mess and doesn’t know what it wants to be. The sound is pretty rough too. I quite enjoyed the title theme which sounded like something you’d expect to hear on the SNES back in the 90s, but after that it all went downhill. Although the tunes in the rest of the game weren’t bad the overall quality of the sound was pretty poor and the sound effects were awful. The sound that triggers when a mine is hit is a buzzing noise, but rather than using a clear buzz tone it sounds as if your speakers are malfunctioning. This game could have potentially redeemed itself a bit with the multiplayer feature as it’s a tidier alternative than taking a travel Battleship game on a journey with you and offers the option of playing the modern mode which can’t be done using a physical game, however even in multiplayer there was another missed opportunity. Given that this game is turn based and relatively simple in design there should have been no issue creating a multiplayer mode using a single copy of the game, which I’d have happily given the game credit for. Unfortunately this is not the case. If you want to play Sea Battle against a friend then both players need to have a copy of the game installed. If the game was overly complicated I could forgive this, but it really isn’t. I do enjoy board games and it is convenient when software can allow you to play against AI (such as when electronic chess boards first popped up), however if you have a DS or 3DS there are so many more fun and interesting games available to occupy your time. That coupled with the lack luster presentations means I can’t really recommend this one. If you’re a very light gamer or you have a desire to relive your Battleship days then this should serve its purpose, outside of that there’s nothing really special to get excited about here. It’s merely a competent take on a simple idea, and that’s where it ends. Tags:Action & Adventure, Battleship, Hasbro, Nintendo, Nintendo 3DS Download Software, Puzzles, Rating 2/10, Review, Sea Battle, strategy, Teyon, WaiS CO. LTD.